Jashub performing at HM157 in Lincoln Heights, Los Angeles, CA, 11/8/2014. 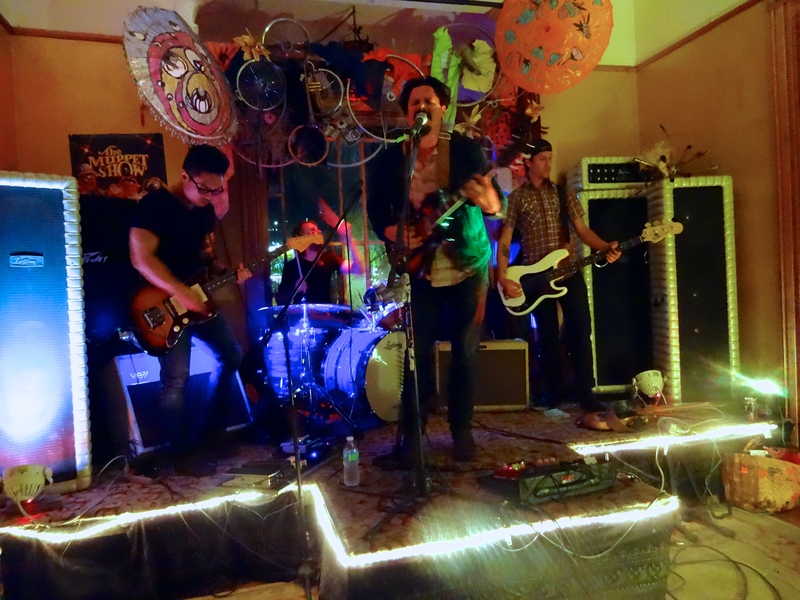 Last Saturday night, I ventured into a funky-old mansion in the middle of Los Angeles’ Lincoln Heights. Music was playing. Haunted decor was all around. A headless man was on a table. And inside of the barely-lit house was furniture adorned with kooky figurines, a track playing in the background and haunted lights all around. At the back of the house, however, was a beautiful open patio space with RVs camped all around, an outdoor-stage, comfy plush furniture and outdoor seating. A bar was tended to by an elder woman–the owner of the house, presumably–with fresh homemade food offerings. This place is literally a gem carved out in LA. I almost felt like I was at a small get-together with friends. Except, these weren’t exactly my “friends.” Rather, I was just a curious long-time fan and supporter of good music. A deeply intimate space set in the historical monument that is HM157, American Tomahawk, with Jashub, The Tulips and Kuzin, produced a fun night of rock & roll, good company and nice chats with friends. If you hadn’t known, I am currently working on a long-form narrative story for one of my workshop classes about a little band I’ve been following for almost a decade. Although their run lasted eight-years, I’ve developed a sort of “musical bond” growing up where I feel personally inclined to always come out and support each of the band members’ current pursuits. That night, Carlo Gimenez, who played lead guitar in Meg & Dia, was performing with Jashub that night. Jonathan Snyder, bassist of the late Meg & Dia, was also there performing with American Tomahawk. And, within that small, comfy space, I was able to meet and overhear things from certain individuals. A dude who used to date Dia. A best friend who went hiking with Meg and hilariously made fun of Nick and his “f**king red pants” (who also has been taking Yoga classes with Meg–and sometimes Dia–at Silver Lake’s local Pop Physique). I was in earshot of some of the band’s closest/local friends, all while kept in the company/carpooled my way over there with one of their long-time close friends from the very beginning, Vil a.k.a. Agent Bear, hearing his own philosophies into art and longevity/friendship with the band taking him on the road with them. As a student journalist, it may seem weird that I’m somewhat of an “outsider looking in,” creeping into their personal space. I started off a fan–obviously–and I developed a personal connection to them. I’m not sure how I feel about my consistently “popping up,” but… Goodness, it’s quite a rare space to be in. Whatever the case, for some reason, nothing else felt more compelling than for me to write about them–about a journey I’ve followed for so long that I myself have grew up with them, in some way, as well. I can feel an epic story coming on. But, beside the case, here are some videos from the night. It was a fun night and perhaps even inspired my own musically-inclined self to just “get out there” and start making my own music! Things like this make me realize my youth and musical ear may be something… It’s time to unleash myself (but goodness did I feel like a baby! ).